I fall in love with fictional characters pretty quickly. I think I first realized this after I watched "Top Gun" for the first time as a child. As such, I thought I'd start this fun section in my blog called "My Fictional Boyfriend" coz, c'mon, who hasn't had one? 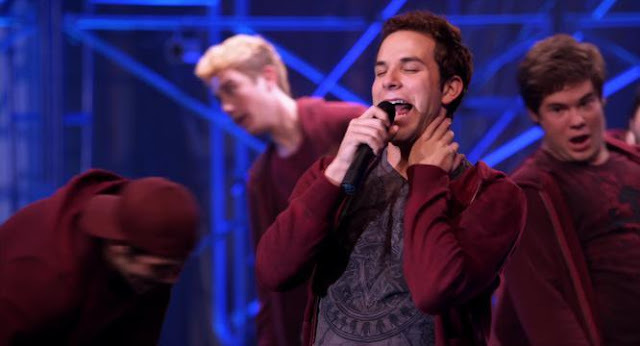 My latest fictional boyfriend is none other than Jesse the Treblemaker from the movie "Pitch Perfect". In fact, I think that, if he wasn't in the movie, I probably wouldn't have liked it as much. He speaks my movie language. Ask anybody I have ever watched a movie with: I have this sad, geeky tendency to babble about random movie trivia during a movie that other people could probably care less about. I also have this sad, geeky tendency to recite lines from the movie when the subtitles aren't on. So, when Jesse whipped out the five movies with the best musical scores, I literally jizzed. And then he introduced Becca to "The Breakfast Club", which just happens to be one of my favoritest movies of all time!!! (I'm an 80's movies' whore. Just read this book review I wrote forever ago.) There was no turning back from there. I was in love. Not only does Jesse love to watch movies, but he actually wants to score movies - which just bumps him up a few levels higher in my territory of swoon. A man who loves movies and music, and actually knows what he's talking about when it comes to movies and music? Come. Into. My. Pants. I'm a sucker for singers. Fun fact: I used to date a guy just coz he was a singer. Looking at the photos now, though... OMG, Anj. What were you thinking? On that note, I've even wanted to turn a couple of gay guys straight just because they were good singers. Fortunately, that disease is cured now. I don't think that one needs any further explanations. Now, looks-wise, Skylar Astin (Jesse's name in the real world) isn't exactly my type. To be honest, he kind of reminds me of Ted Mosby from How I Met Your Mother... whom I used to hate (and now, surprisingly, have a slight obsession on). OMG. What is happening to me? I need to get out of this craze. I don't think my family can take me listening to "Bright Lights, Bigger City" from the movie soundtrack over and over again for much longer. "I have this sad, geeky tendency to babble about random movie trivia during a movie that other people could probably care less about. I also have this sad, geeky tendency to recite lines from the movie when the subtitles aren't on." Ted Mosby.hahaha! ;) I think I'm watching too much HIMYM. me.. robert pattinson and christian grey, i really love to have a man who is passionate as them, though they are fictional character..hahaha. i just love watching them all over again!